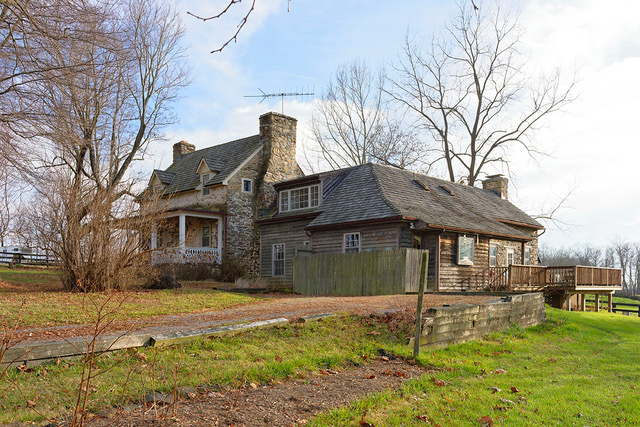 If charm and country living is what you seek, then come see Small Spring Farm. This unique farm house joins 2 houses together with one side available for rent. Owner in DC to keep smaller side for occasional weekends. Larger side being rented offers 3 Bedrooms, 2 full Baths, a country Kitchen filled with light, a separate Dining Room with slate flooring with glass sliding doors that open to the deck with incredible views. The Family Room features a large stone fireplace, beamed ceilings and custom built-ins. 3rd Bedroom is on the main level and could be a Den or Home Office. Master Bedroom with walk in closet and 2nd guest bedroom on the upper level. Unique 1.5 baths on upper level. Hardwood floors, exposed stone walls, a side porch and lovely rear deck with seating area and table space - ideal for entertaining. May be rented furnished or unfurnished. Potential for one large paddock and shed for a horse is available. Separate tenant in barn cottage on back of farm. Security Deposit, References and credit report required. Pets on a case-by case basis. No smokers.